Surveillance cameras flap their wings in the sky just like birds and bats. Tiny little hairs on gecko feet help a robot climb a smooth vertical surface. 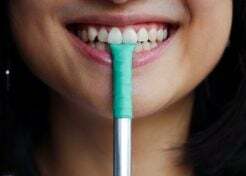 The impact-resistant surface of human teeth inspires light and durable aerospace materials. 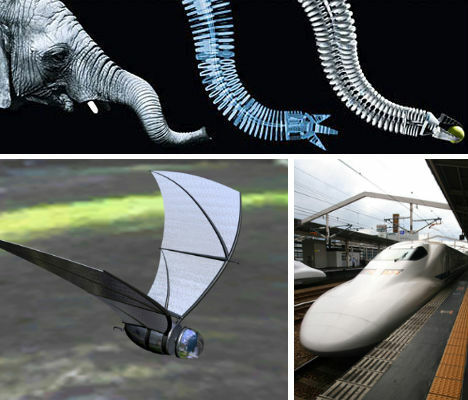 Just like designs inspired by the sea, insect-mimicking inventions and buildings that look like natural terrain, these 14 examples of biomimicry based on animal and human biology capitalize on the unparalleled efficiency of nature. Robotics have always been bound by the limitations of the computers of their time, but as computer technology continues to evolve, more complex calculations for a wider range of movements become possible. 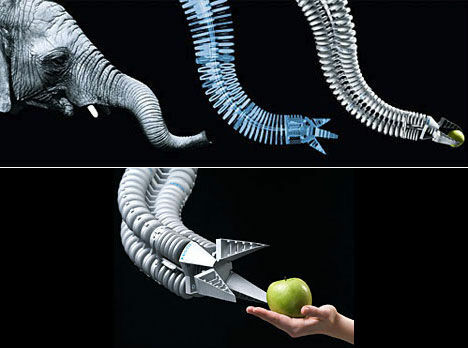 And the capability of flexible, pliable movement has given way to more advanced designs like this one: a new ‘biomechatronic’ handling system based on an elephant’s trunk. 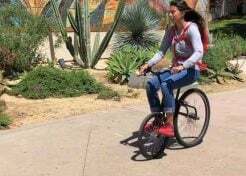 Created by German engineering firm Festo, the Bionic Handling Assistant smoothly transports heavy loads, expanding and contracting by inflating or deflating air sacs within each ‘vertebrae’. Bats have unwittingly become the inspiration for a government surveillance device. The United States military commissioned the COM-BAT from the University of Michigan College of Engineering, giving them a five-year, $10-million-dollar grant to develop the design. Fitted with a solar panel in its transparent ‘head’, the 6-inch spy plane has wings shaped like those of the flying mammal. The plane must be able to collect large amounts of surveillance data while running on only 1 watt of power. “Skulls in general are extraordinary impact-resistant structures and extremely light at the same time as they protect the most important organs of an animal body and this performance and physical property can be applied in structure or architecture design,” says architect Andres Harris, who has studied animal bones – particularly bird skulls – extensively in a bid to design a highly efficient bio-inspired surface. 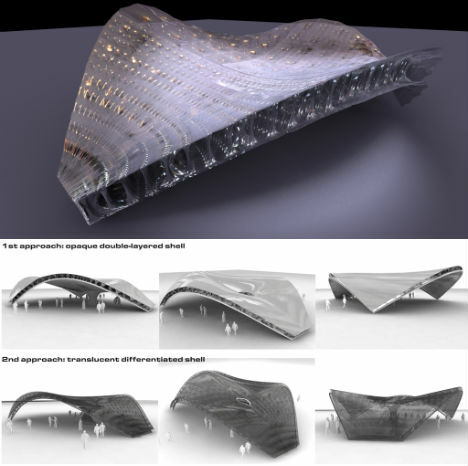 Harris imagines mimicking the material for a large pavilion, and the blog Biomimetic Architecture notes that this concept could also be applied to cars. The kingfisher dives into the water from the air without making a splash, mostly thanks to its highly efficiently-shaped beak. 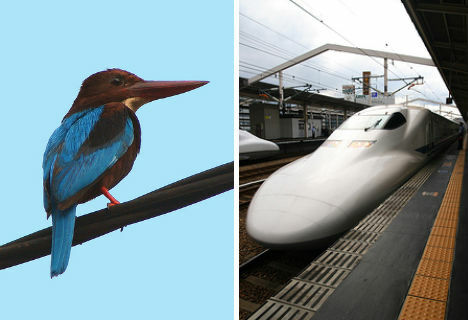 In a stroke of genius, engineer and bird enthusiast Eiji Nakatsu realized that the same shape could solve an annoying problem faced by Japan’s ultra-fast bullet trains, which created a loud booming sound like a thunder clap whenever they exited a tunnel. The nose of the train was pushing air at high speeds, creating a wall of wind that not only made the loud sound, but also slowed down the train. The new, kingfisher-inspired train nose eliminates this problem, making the trains up to 20 percent more fuel efficient. Sure, computer tech has advanced a lot in recent years – but even supercomputers still can’t recognize human faces as well as cats can. 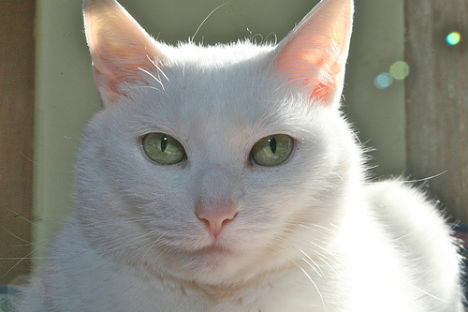 The University of Michigan decided to study the feline brain in order to develop an intelligent computer. The idea is that current computers execute code in a linear fashion, as opposed to the mammalian brain, which can process many things at once. Lu is in the process of developing a circuit element that behaves like biological synapses. This ‘memristor’ can remember past voltages that passed through it in a way that is similar to memory and learning in the brain. Why cats? Computer engineer Wei Lu says it was simply a more realistic goal than mimicking the brain of a human. It doesn’t have any cool physical features that reveal its inspiration, but the Ultracane wouldn’t be possible without study of the way bats get around in pitch blackness. In the same way that bats can “see” in the dark using ultrasonic echoes that reveal the location of obstacles, the Ultracane warns blind users of objects in their path. 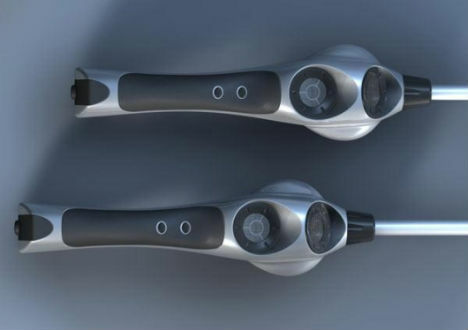 A number of sensors on the cane even make it possible for users to sense objects higher than head height. Faster than any human-designed radio-frequency spectrum analyzer, this radio chip also needs very little power to operate. How is that possible? The design is based upon the human ear. MIT researchers looked at the way the cochlea converts sound waves into electrical signals sent to the brain. The sound waves create mechanical waves in the fluid of the inner ear, which activate tiny hair cells that facilitate electrical signals. 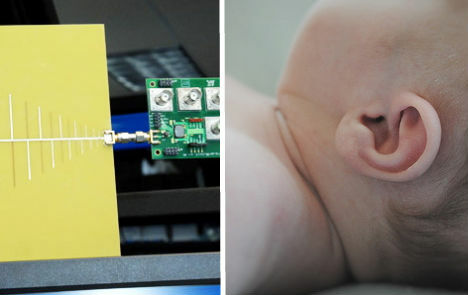 Rahul Sarpeshkar used the same design principles in his artificial cochlear radio chip, which would make possible wireless devices that can receive cell phone, internet, radio and television signals. ““The more I started to look at the ear, the more I realized it’s like a super radio with 3,500 parallel channels,” said Sarpeshkar. 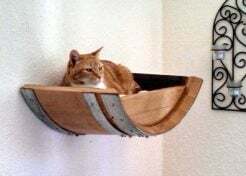 Here’s yet another invention to make you paranoid that that little flying creature above your house is no ordinary bird or bat. 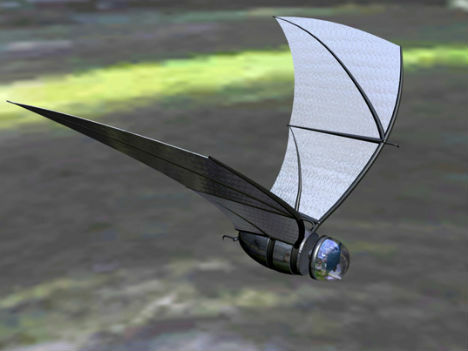 The RoboSwift, as implied by its name, is based upon the biology of the swift, a family of birds capable of extremely fast flight. 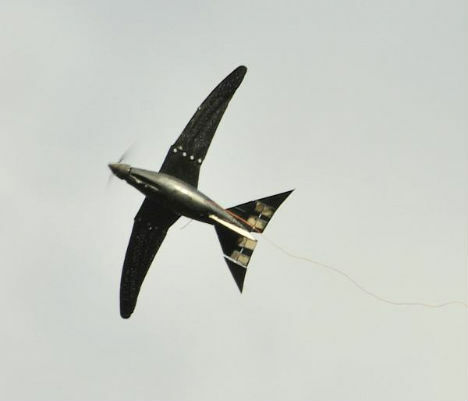 Developed by Delft University of Technology, the RoboSwift is equipped with observation cameras that might be used either to study birds, or possibly for surveillance of human activity. Wind tunnel tests have found that its flight is remarkably bird-like thanks to the ability to fold its ‘feathers’ backwards. How can a robot climb a smooth surface like glass without using suction cups, which are slow and inefficient? 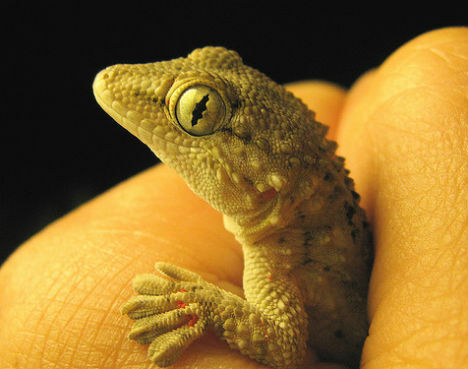 The secret lies in the intricate design of a gecko’s toes. Mark Cutkosky, a professor of mechanical engineering at Stanford University, developed the ‘Stickybot’ with the same type of dry adhesive that lets those lizards cling to the most improbable of surfaces. This ‘directional adhesive’ relies on millions of hairs on the ridges of a gecko’s foot with split ends that interact with the molecules of the climbing surface. “Other adhesives are sort of like walking around with chewing gum on your feet: You have to press it into the surface and then you have to work to pull it off. But with directional adhesion, it’s almost like you can sort of hook and unhook yourself from the surface,” Cutkosky told ScienceDaily. What makes the antlers of a deer so bone-crushingly strong? Scientists at the University of York in the UK weren’t sure exactly how the moisture level in deer antlers affects their strength. 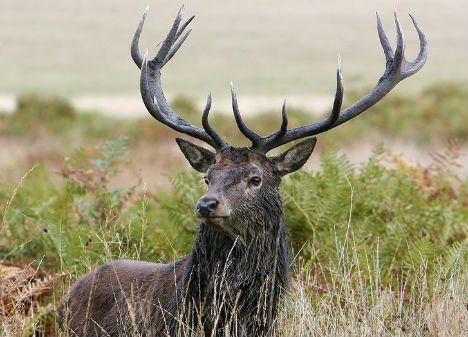 They studied antlers that were cut just before the stage when stags start dueling, when they need their antlers to be at their strongest, and discovered that during this period, the antlers dry out. Dry, stiff materials are usually brittle and easily breakable, but deer antlers proved to be 2.4 times stronger than wet bone. This revelation seems to have solved a puzzling problem for engineers: making a material that is both stiff and tough. The structure of deer antlers will likely become the basis of incredibly durable industrial materials. Our teeth are only about a strong as glass – so how can they withstand nearly a lifetime of chomping on all kinds of hard foods? 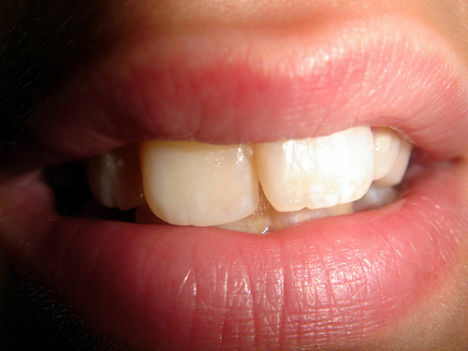 Researchers at Tel Aviv University examined thousands of extracted human teeth and found that under stress, the highly sophisticated structure that makes up the exterior of our teeth forms a network of micro-cracks instead of large ones. These tiny cracks are then able to heal over time. If engineers can find a way to replicate this ‘wavy’, multi-layered structure in a synthetic material, they could develop lighter and more crash-resistant aircraft, though the self-healing properties are probably a long way from realization. Feet aren’t the only part of gecko anatomy that’s got engineers excited. Scientists have discovered that geckos have a series of distinct concentric zones in their eyes that make it possible for them to see colors at night, an ability few other creatures have. These zones have different refractive powers, giving geckos a multifocal optical system that allows light of different wavelengths to focus on the retina at the same time. 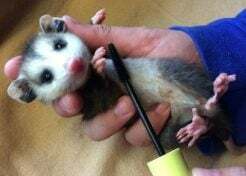 This makes their eyes 350 times more sensitive than humans, and lets them focus on objects at different distances. The discovery may allow engineers to develop more effective cameras and possibly even multi-focal contact lenses. 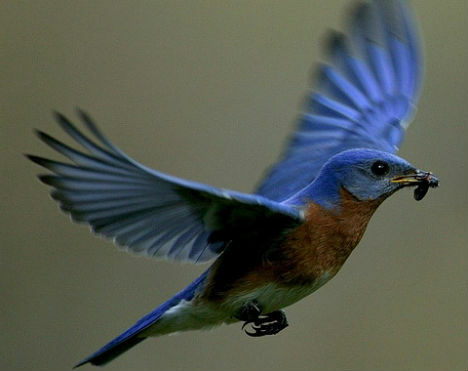 The brilliantly colored feathers of the male Eastern bluebird aren’t created by pigments, like most other colors found in nature – that shade of blue is actually produced by nanostructures that self-assemble in much the same way as beer foam. Essentially, they form the same way as materials undergoing ‘phase separation’, when different substances become unstable and separate from each other. Color-producing structures in feathers start out as bubbles of water inside living cells, and are replaced with air as the feather grows. These intricate optical structures, which look like sponges with air bubbles under a microscope, are being used to create a new generation of optical materials in the lab. 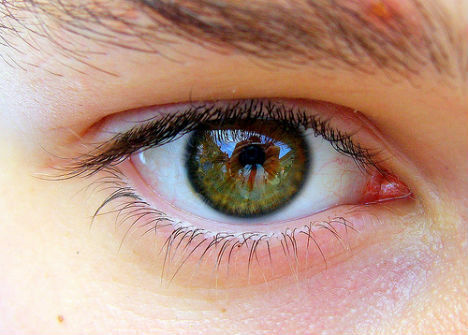 The curved surface of the human eye facilitates a wider field of view than has ever been possible using a camera. The challenge for engineers was to transfer microelectronic components onto a curved surface without breaking them. Yonggang Huang of Northwestern University and John Rogers of the University of Illinois built a digital camera of the same size, shape and layout of the human eye, and developed a mesh-like material that hold electronic components onto the curved surface. This technology would enable photographs that are entirely clear and focused, unlike today’s cameras which can focus only on certain areas. It may even enable the development of an artificial retina or bionic eye.